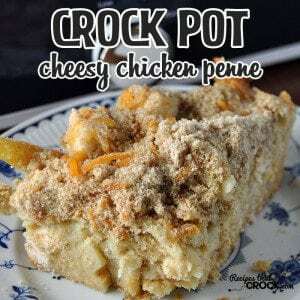 Crock Pot Cheesy Chicken Penne - Recipes That Crock! If you want a new go-to recipe that is ah-mazing, then I have a treat for you! 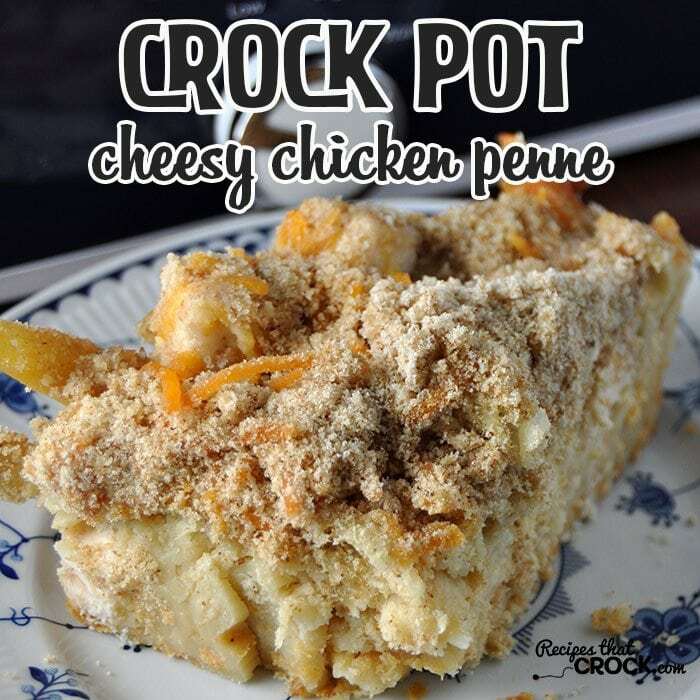 This Crock Pot Cheesy Chicken Penne I adapted from Gooseberry Patch’s Game-Day Fan Fare is so delicious! I love a good pasta dish, don’t you? This Crock Pot Cheesy Chicken Penne is not only delicious, it is a recipe that is sure to be a crowd-pleaser! This is a recipe that requires a little bit of prep-time, but it is SO worth it! I used Cheddar instead of American cheese like the original recipe calls for, so if you want to mix it up, you can try it with American too! I used Cassie (my casserole crock pot). 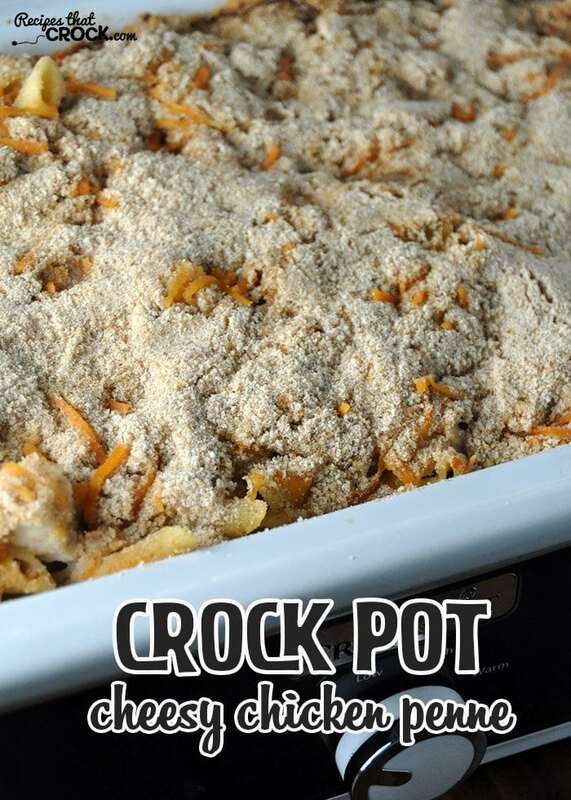 While she is only a 3.5-quart crock pot, she is designed to let things be spread out, so if you are using a regular crock pot, I would advise using a 5-6 quart. 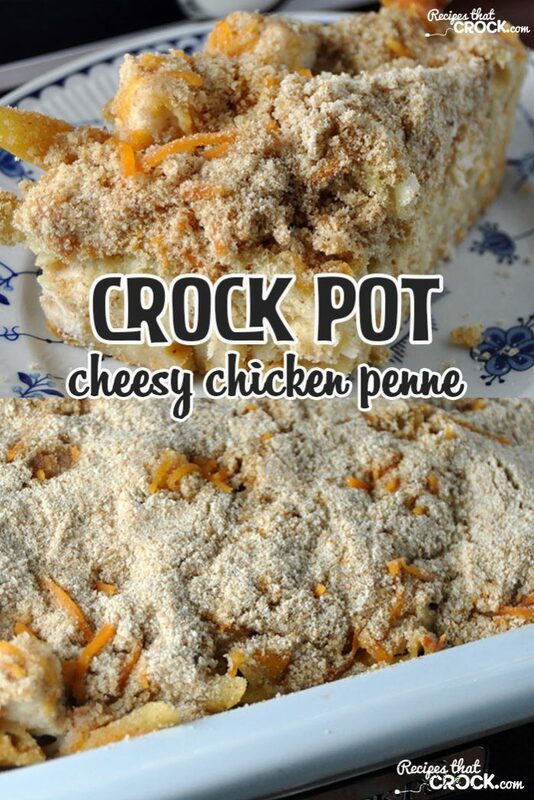 This Crock Pot Cheesy Chicken Penne is sure to be a crowd-pleaser! Loved it!! But I would love it even more if it could be adapted to use uncooked pasta. (Then it would get the 5 th star ;). I totally love the recipes that call for uncooked pasta. I am all about quick,easy, and no precooking as little as possible. This is on my list of “Must Make”. Thanks for always sharing your great recipes. Thank you so much! We love hearing that people are enjoying the recipes we share! You are going to love this one! Enjoy!